​Finally, take out your frustrations for the economy, healthcare, unemployment with this hilarious 54" tall punching bag. You inflate him, and fill the durable built in pillow in the base with water or sand. Whack him in the head and he falls over, but he jumps right back up. 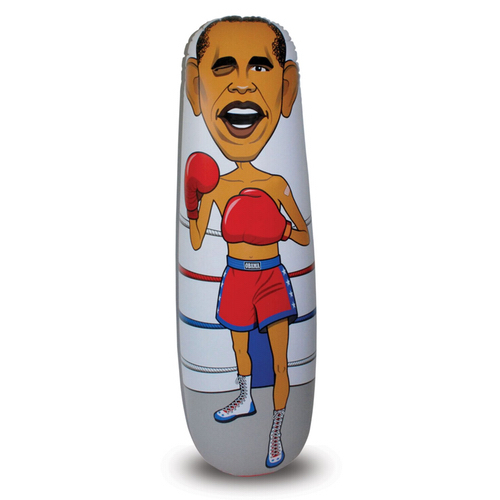 Love him or hate him, you will go crazy over our hilarious 54" tall punching bag. Made from extra thick vinyl, the Bop Obama ships flat. You inflate him, and fill the durable built in pillow in the base with water or sand. Whack him in the head and he falls over, but he jumps right back up.